Original plate. 03 Jul 2017. None. © Out of copyright. Chosen, Japan; original illustration prepared by Okamura. Published in: Okamura, K. (1913). On the marine algae of Chosen. Reports of the Imperial Bureau of Fisheries 2: 17-30, pl. VI . In Japan, restricted to the Sea of Japan. Accesses: This record has been accessed by users 3714 times since it was created. Anonymous (1997). 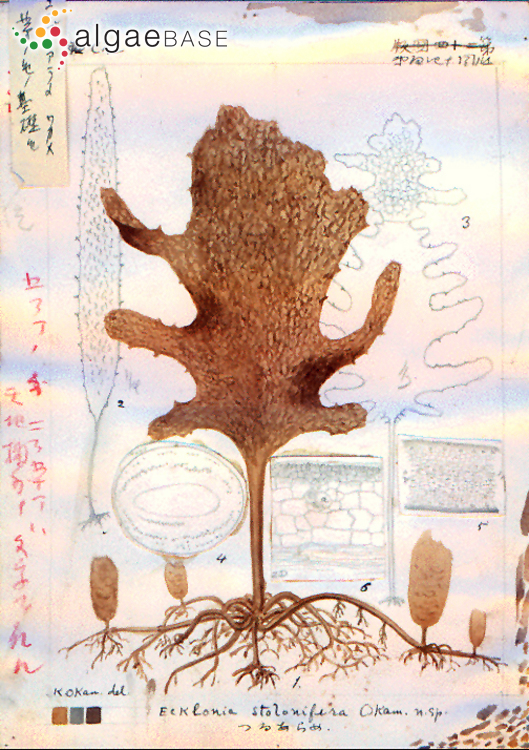 Lectotypification of Ecklonia stolonifera Okamura and morphological comparison on root between E. stolonifera and E. kurome Okamua (Laminariales, Phaeophyta). Japanese Journal of Phycology 45: 15-19. Kim, N.-G. & Yoo, J.S. (2003). Structure and function of submarine forest 2. Population dynamics of Ecklonia stolonifera as a submarine forest-forming component. Algae 18(4): 295-299, 3 figs. Notoya, M. & Aruga, Y. (1990). Relation between size and age of holdfasts of Ecklonia stolonifera Okamura (Laminariales, Phaeophyta) in northern Honshu, Japan. Hydrobiologia 204/205: 241-246. Notoya, M. & Asuke, M. (1983). Influence of temperature on the zoospore germination of Ecklonia stolonifera Okamura (Phaeophyta, Lamionariales) in culture. Japanese Journal of Phycology 31: 28-33. Notoya, M. & Aruga, Y. (1990). Relation between size and age of holdfasts of Ecklonia stolonifera Okamura (Laminariales, Phaeophyta) in northern Honshu, Japan. 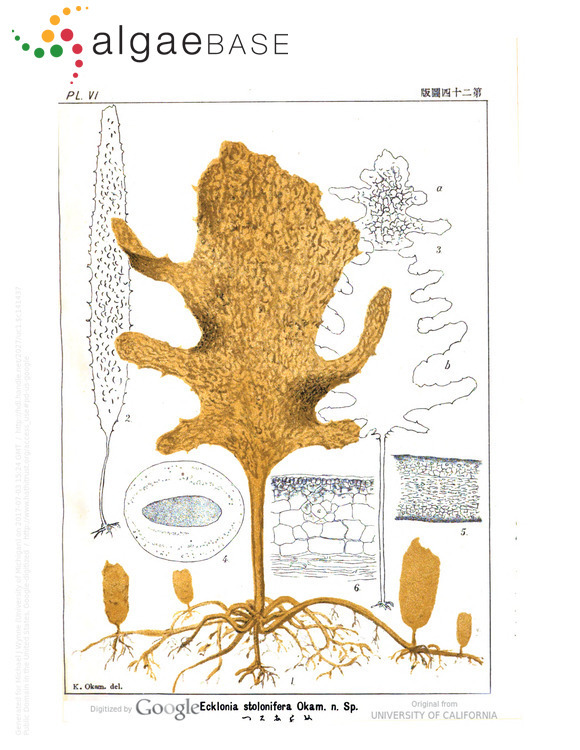 Proceedings of the International Seaweed Symposium 13: 241-246. Notoya, M. (1988). Tissue culture from the explant of Ecklonia stolonifera Okamura (Phaeophyta, Laminariales). Japanese Journal of Phycology 36: 175-177.